Last year I participated in the Christmas link up that Laura at Bugs and Fishes organized. There were so many fantastic projects and so many different ones! Well she’s organized another one, this one is all flower themed and I’m thrilled to take part again! 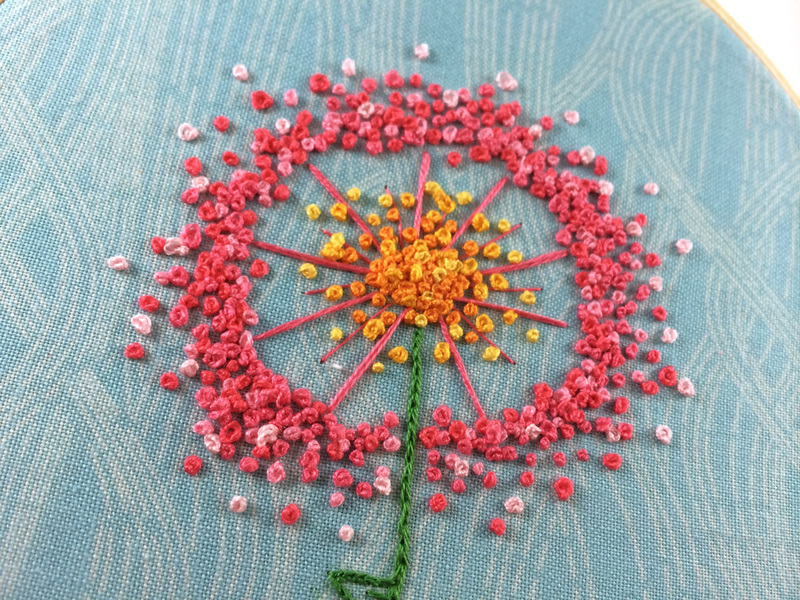 I created a colorful dandelion puff embroidery and I’m sharing the pattern with you! Now this pattern isn’t exact, I improvised a lot, but I’m giving you a basic framework to start with. I did the center lines and then worked the French knots in the center and then the outside. The black areas of the pattern are where the French knots are a solid area. The dots give a general idea of how to make the knots taper off. I didn’t use any pattern at all and added them until it felt “done.” For the stem and leaves I did a chain stitch. For the center I used two colors and the outer circle has four, but use however many you feel comfortable with! This really has so many possible variations, just have fun with it! Head over to this post to see the full list of flower projects! This is really pretty. I’ve never done embroidery so I don’t know much, but this looks really different. Full of texture lots of interest. Love it! Thanks! I usually cross stitch but I’ve been delving into embroidery more. There are so many different stitches and they all give a different texture and feel. I want to play with it more! This is awesome! I always kind of dread projects involving a lot of French knots, but once I get started and in the knot-making groove, I find it so satisfying! 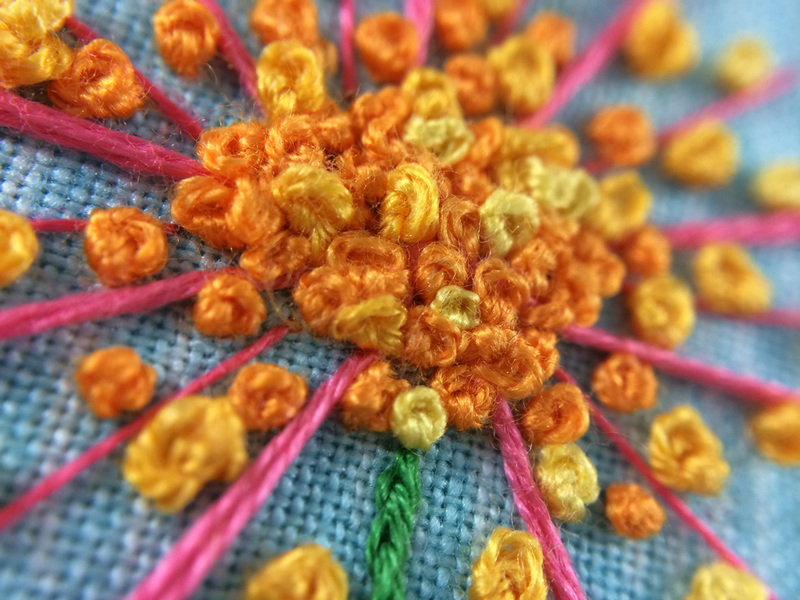 I had a hard time getting the hang of it, but now I’m kind of French knot obsessed. You’re right, they are extremely satisfying! I LOVE Dandelions! This is so cool! 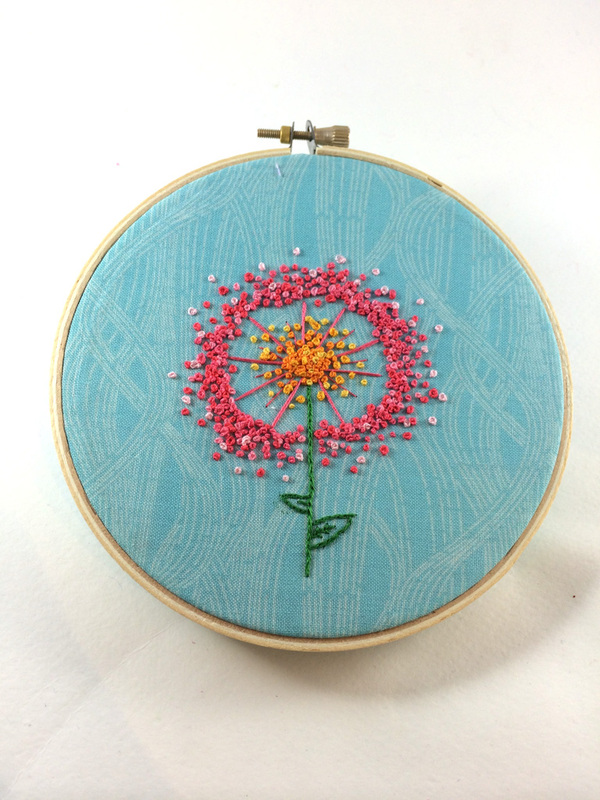 I love dandelions and have just discovered the wonderful world of embroidery ^_^ Plus, I have a mini embroidery hoop in my stash waiting to be finally used, so this is the perfect project! If you decide to stitch it up, I’d love to see! I want to make a whole series of these in different colors and sizes to hang up! Holy Cow this is gorgeous! Wish I had more patience for hand work! Thanks! I love doing slow hand work, I find it so relaxing. I really love the repetitive nature of it. I love the embroidery pattern and the colour choices are just great! Thanks! I really love being able to work on a colored and patterned fabric background. It adds so much more personality and makes the color pop. i used long strengt of threath till the middle and some criss cross small on the end. i did this on layers of paper i had glued together. but yours is totally different i like that. thank you for the sharing and your template. That sounds absolutely amazing. Do you have a photo online somewhere? I’d love to see it! I’m sure this will wind up on a CQ block sometime, because I’m always putting something dandelion-like on them. Thanks so much! I saw a link to your blog post on flowers on sameliasmum and had to come see. That led me to this post.